This past Christmas, my gf Teri gave me a SU scallop envelope die as one of my gifts. I had wanted this die since it first came out and saw many cards made with it. Over the weekend I finally got the chance to play with the die. And I made this box and put some goodies in it. 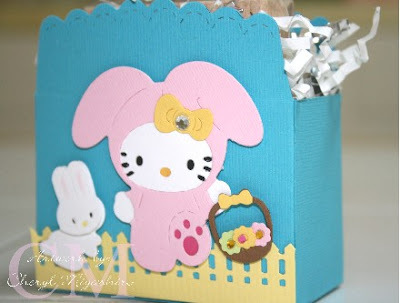 I love the new Sizzix Hello Kitty spring dies and of course the MS fence punch that I bought from Ben Franklin Crafts. 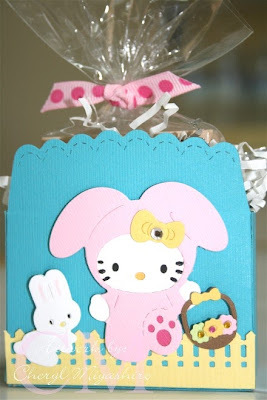 I know, I keep posting projects made with HK dies but I love Hello Kitty!!! 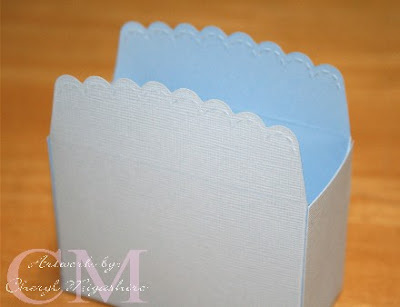 Here's a short tutorial on how I made this box (I'm still new at doing tutorials): Step 1: Die cut 2 envelopes from the scallop envelope die. Cut a strip of cardstock at 1 1/2" wide by 7 3/4" long. Score at 2 1/4" and 5 1/2". 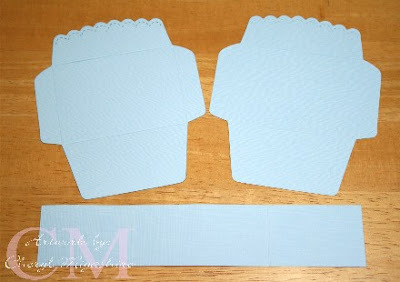 Step 2: Place 2 way tape on the sides of both envelope pieces and on the bottom of one of the envelope pieces. I used Score Pal tape because it's stickier tape and holds very well. It's my favorite tape to use now. Step 3: Ok, my hands were getting shaky at about this time because the Starbucks coffee was taking effect. Place the bottom of the taped piece over the bottom of the piece that doesn't have tape. Like in the photo. 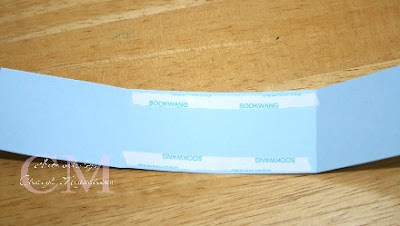 Step 4: Place tape on the strip of cardstock between the 2 scored lines. Actually you could probably place tape along the whole strip of cardstock and eliminate the tabbed pieces on the side of the envelope. But this is the way that I initially did the box. Step 5: This is how the box looks like before you embellish it. 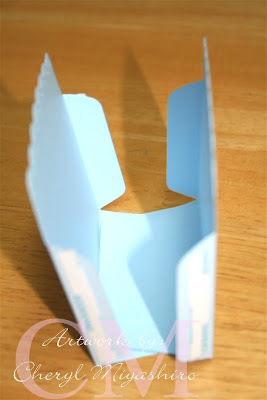 You can also add a handle to it or fold the flaps down and make it look more like a rectangle box. Hope you enjoyed my short tutorial and thanks for stopping by today. Come back tomorrow because I have another tutorial using this same die. well here's another tutorial I must try! you made it look so easy! and that HK bunny is too cute for words! you do a great job in making those! I am overwhelmed by it all =) what a great gift to give! TFS! I will have to try it soon! Thank you for a wonderful tutorial. 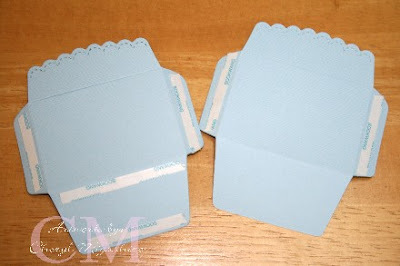 It's great to see another use for the scallop envelope die! Hi Cheryl! Wow! I love what you did with this envelope die. Easier than the other box...sounds good for Easter!! See you soon! tutorials are sooo much fun to do, huh? glad to see another one made by you..... love this envie box.... tooo cute!!! This box came out soo cute! I've been meaning to make one of these, but never got around to it. I'm definitely going to do one now! Great Tutorial, and a very cute project!! Thanks for sharing.